I'm new to this forum and I need some info about the 2005 Hyundai Accent GT. My car has been hesitating really bad. When I go to take off at a stoplight it bucks and hesitates. It almost sounds like it's going to backfire but doesn't. It just started doing this a few days ago and it's already getting worse. Now, it's hesitating really bad even when I'm not stopped. The engine checklight just finally came on. I looked up a lot of info about this and most people are saying the Mass Air Flow Sensor could be dirty. Can anyone tell me where the mass air flow sensor is located? My husband has a 2000 Camaro and his is located right at the back of the air filter "thing" (Sorry, I don't know much about cars). We looked under the hood for it on the Accent and we took the air filter tubes and everything off and couldn't find it. I tried looking up parts to see what it even looks like and I found 2 totally different looking ones for the same year and model car, so I still don't know what it looks like. Any help on this would be greatly appreciated. I'm going to go up to AutoZone and have them hook it up to tell me what the code is. I couldn't do that before cause the engine light wouldn't stay on and they told me they couldn't check it unless the light was on when I got there. Again any help on this would be greatly appreciated!!! Thanks!!! here's the MAF, or MAP is really what it is - manifold absolute pressure. 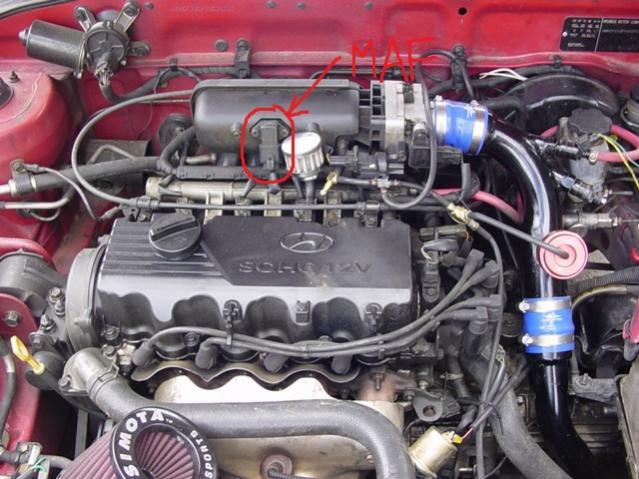 the MAF is a flow sensor found on older cars, it has been made obsolete by the MAP. my mistake on labeling it the MAF, but you get the idea. your engine will probably look different, but its in the same basic location. on the front middle of the intake plenum. secondly please please get yourself on www.hmaservice.com. you must use IE, get a free account to log in with (like these forums) and download the necessary plugins under site requirements. there is troubleshooting information there along with service info/procedures for your error code. its under the DTC link along the top, may have to hit the link for "Shop" first cant remember. finally, autozone are being idiots. weather the light is on or not **the ECU stores the code**. there are even some codes that do not throw a light but the ECU will still store. only way to get rid of them is to either clear with a code reader or disconnect your battery for a few minutes. without that error code, there isn't much anyone can do but take a shot in the dark. if places like autozone are giving you hassle, i would invest in a code reader. they're not that expensive like they used to be - i bought a rather nice one for $150 CAN on sale (i'm up in canada) and there are cheaper ones. those ones only give you the code and the ability to erase it - no other data. however, drop that code into google or look it up on HMA and you will have your answer. the better ones just give some more information is all - most of the time you don't need it, just nice to have is all. I'm going to go up to AutoZone and have them hook it up to tell me what the code is. I couldn't do that before cause the engine light wouldn't stay on and they told me they couldn't check it unless the light was on when I got there. As long as the light has been on, there should be a code stored for somebody to find... the memory does not just clear itself..
Produce a valid code, and I can translate that into real Hyundai language.. I have the exact same issue. Intermittent check engine light. I think the picture on your answer is the same as my 2001 Hyundai Elantra. I want to try to clean the MAF sensor or replace it. Your advice? The error codes are P0110 and P0100. Both say it's a MAF problem.